The modern clean-in-place skid is cleverly designed and built to last. The process of clean-in-place (CIP) involves passing a cleaning fluid across a surface to remove product soils. Unlike manual cleaning or clean-out-of-place (COP), CIP requires no equipment removal or disassembly. Time The duration of time that a surface is exposed to cleaning fluid. Action The level of impingement a surface experiences during cleaning, dependent of flow velocity or spray device design. Concentration/Conductivity The amount of chemical per unit volume contained within the cleaning fluid. This includes caustic, acid, and sanitizer. Temperature The amount of heat energy within the cleaning fluid that can be transferred to a surface. The pie graphs above illustrate various combinations of parameters. Each product or application requires different combinations and levels of the parameters. For example, oily residues are more efficiently cleaned by increased temperature and chemical concentration, while action has little effect. Conversely, viscous and thick residues are more efficiently cleaned by increased action and time, but concentration may have little effect on cleaning. Within every plant, there are numerous process lines, tanks, and areas in need of CIP. Each one of these is called a circuit. Circuits should be evaluated independently to determine the specific set point of every parameter. The CIP skid is the heart of CIP. 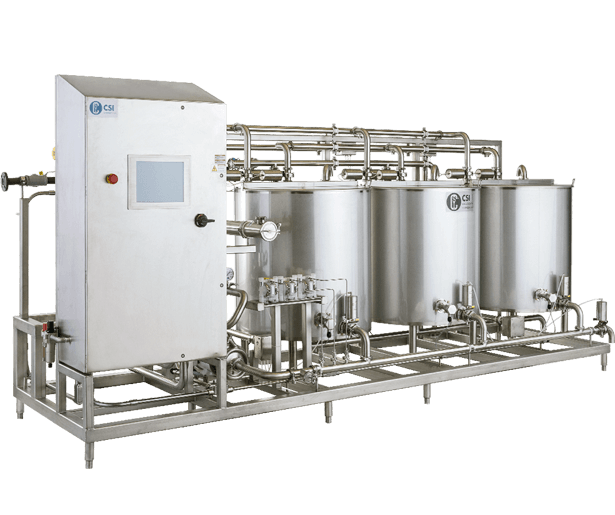 The CIP skid supplies all cleaning circuits with the necessary flow, temperature, and conductivity for the correct amount of time through automated control. Although there are many differences in design, nearly all CIP skids have common components that are vital to their functionality. These components include one or more tanks, a pump, flow meter, heat exchanger, temperature transmitter, conductivity meter, and associated valves and piping. 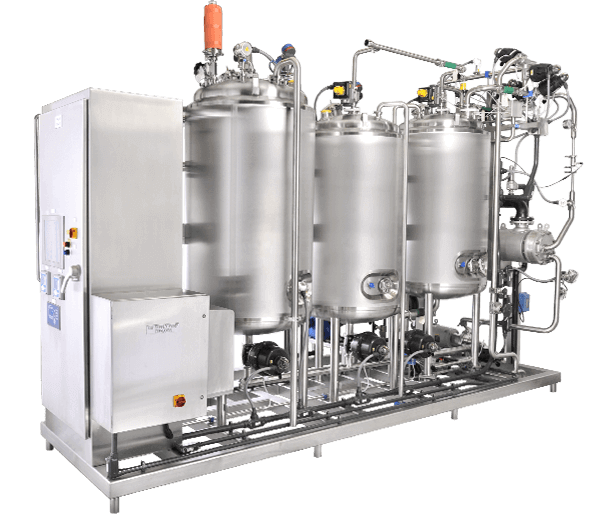 Many CIP systems in the sanitary industry are constructed as modular in design. Modular systems are preferred over traditional “stick-built” systems, as they can be fabricated off site and installed once complete. Modular systems drastically reduce installation and startup time, resulting in less exposure to fabrication processes within the facility and less plant downtime. 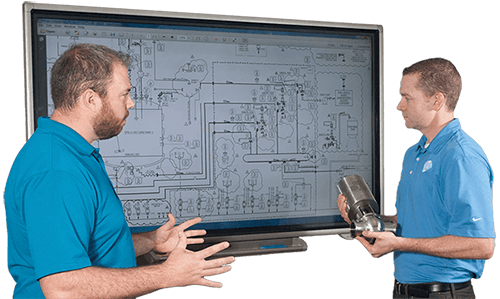 Modern CIP systems are more efficient and intuitive than their predecessors. By automating the routine of cleaning, a plant can have faster cleaning times, shorter downtime, higher repeatability, the ability to track and record cleaning parameters, and lower utility usage. Manual cleaning, while necessary in some areas of facilities, prevents consistency and repeatability regardless of how rigorously it is performed. This type of cleaning introduces human error and neglect into the process. Automated processes alleviate this type of error and neglect by allowing the computer to perform a set of instructions at specified levels the same way every time. If the parameters are not met, the system will provide a warning to show which areas were not up to standard. With this level of control, facilities can be certain that all parameters were met and cleaning was performed as required. In addition to consistency and repeatability of a CIP system, data tracking and recording are increasingly important due to the Food Safety Modernization Act (FSMA). Accurate data records provide the information necessary to prove the validity of the cleaning process, an aspect that is critical in the rare cases of product recalls. A good CIP system will allow all critical parameters to be tracked and recorded. When designed and built properly, a robust CIP system is an investment in the security of your brand and the people who enjoy that brand. 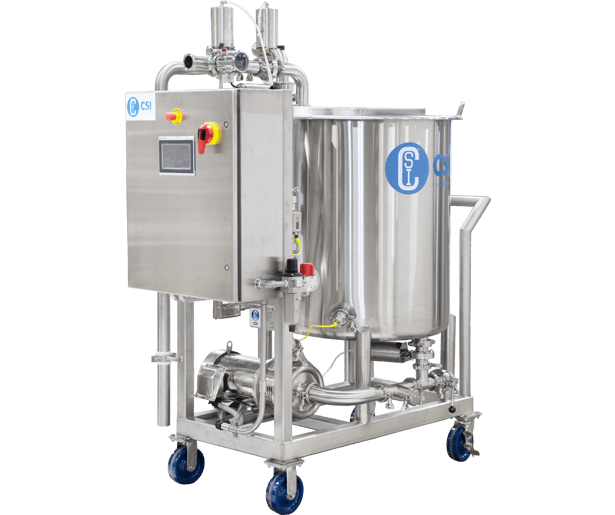 Compact CIP is for cleaning tanks, process equipment, and associated lines that cannot be efficiently or cost-effectively serviced by a larger system. A custom CIP skid has limitless options, giving the freedom to add or install anything needed, including specialized programming or equipment. The CIP 2.0 skid is a state-of-the-art control system that incorporates the latest clean-in-place technology from Rockwell Automation/Allen Bradley. CSI has a team of experts on stand-by to answer any question. Browse our employee directory to find the person you need.